Before the weekend, a point for Sunderland looked like being an acceptable return from Tyneside in at least preventing new Newcastle boss Rafa Benitez from generating any upwards momentum. 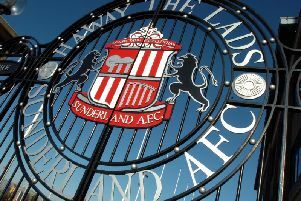 Yet in the end, Sunderland were again ruing their utter inability to keep hold of a lead after being forced to settle for a point, rather than three, for the third game on the spin. Jermain Defoe's 12th Premier League goal on the stroke of half-time had been just rewards for Sunderland's superiority in the opening 45 minutes, when the England striker had twice gone close. Patrick van Aanholt drew a brilliant save out of Newcastle stopper Rob Elliot just before the hour mark, yet then Sunderland's control began to slip. The Magpies began to come back into the encounter and they snatched a draw with seven minutes remaining when Aleksandar Mitrovic headed home to leave Sam Allardyce's men hanging on at the death. Both sides mustered half chances early on, yet shots were skied over the bar from Jermain Defoe and then Aleksandar Mitrovic. Jack Rodwell produced the opening effort on target in the ninth minute when his header from Wahbi Khazri's free-kick from the right was tipped over the bar by Rob Elliot. Defoe was then a whisker away from the opening the deadlock after firing into the side netting. DeAndre Yedlin had picked out the overlapping run of Rodwell down the right and he pulled it back low into the path of Defoe, whose hooked shot had Elliot beaten at the near post, but drifted just wide. Moments later at the other end, Andros Townsend tested Vito Mannone with a shot from 20 yards that the Sunderland keeper couldn't gather cleanly. Sunderland were on top though; Defoe inches away from tapping in Khazri's cross-come-shot at the far post. The Black Cats survived a scare on the half-hour mark when Ayoze Perez was fouled on the edge of the area and Jonjo Shelvey whipped a free-kick inches wide. But on the stroke of half-time, Sunderland went ahead as Defoe finally found his shooting boots. Khazri took a corner short to Fabio Borini on the edge of the area, whose right-foot shot took a deflection and was brilliantly tipped away by Elliot. But as the ball eventually dropped, Defoe was on hand to cushion a volley into the net. Only a goal-line clearance from Yann M'Vila prevented the Magpies pulling level within two minutes of the restart after Mannone got nowhere near Townsend's right-wing corner. Perez directed the ball goalwards at the far post, but M'Vila came to the rescue by booting it away. But at the other end, Elliot produced an absolutely magnificent save to prevent Patrick van Aanholt doubling Sunderland's advantage in the 58th minute. Khazri had lost possession down the left-hand side of the Newcastle area, but van Aanholt raced onto the loose ball and hit a rasping left-foot shot across goal which was brilliantly palmed away by Elliot high to his left. Sunderland had faded as the half wore on and they began to sit ever deeper, and Newcastle levelled proceedings in the 83rd minute. Georginho Wijnaldum was able to go past Sunderland substitute Dame N'Doye far too easily down the right and the Dutchman lifted the ball to the far post when Mitrovic headed home.